Things are always on the move in the real estate market, with gorgeous homes being bought and sold all the time. It seems like everyone has the “HGTV bug” these days, so we’ve rounded up some of the latest real estate deals to give you a peek into the homes some of our favorite people are adding and subtracting from their portfolios. Actor Tom Cruise has bid adieu to Los Angeles for good with the sale of the Beverly Hills compound he and Katie Holmes shared before their divorce. Cruise owned the home on Calle Vista Drive for almost a decade, and at 10,000 square feet, he reportedly sold it for $40 million. The 35-room house has seven bedrooms, nine bathrooms, swimming pool, tennis court, playground, and several guesthouses. Kylie Jenner has purchased a $6 million dollar home in Hidden Hills, where her mom Kris Jenner and sister Kim Kardashian also own property. The 18-year old supermodel bought her last home just a year ago, for $2.7 million. Her new home is a Cape Cod with six bedrooms, seven baths and clocking in at over 7,000 square feet. It also has a wine cellar, pool, and giant walk-in closet. The kitchen has stone counters and stainless steel appliances, and opens to a large family room with fireplace and adjoining patio. The house also includes formal living and dining rooms, a theater room, high ceilings, hardwood floors, and four-car garage. The pool is adjacent to a covered patio with an installed barbecue. 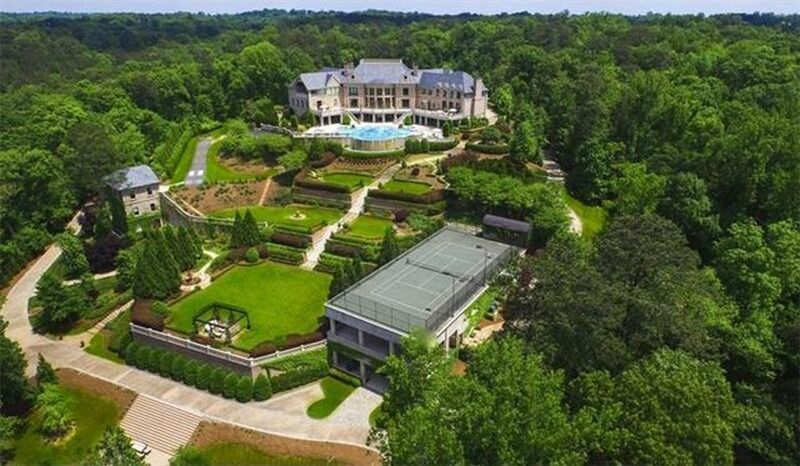 Actor, screenwriter, and producer Tyler Perry just sold his Atlanta mansion for $17.5 million. The listing calls it, “the most compelling private residence to ever be offered to market in the history of Atlanta.” The home sits on the Chattahoochee River and is 35,000 square feet. It features an infinity pool, hobby house, underground ballroom with catering kitchen, and a generator with full-estate capabilities. Perry purchased the land in 2007 and subesquently built the seven-bedroom house. Other amenities include a fully equpped gym, lighted tennis court, theater and formal and informal gardens. Tennis star John McEnroe is trying to offload his Hamptons estate for $14.5 million after buying it for $4.2 million in 1999. The house, which is on Squabble Lane, comes with deeded access to a stretch of Southampton beach. Neighbors include Howard Stern, Calvin Klein, and Brooke Shields. It has eight bedrooms, seven full bathrooms, a living room with vaulted ceilings, and casual and formal dining areas. There is also a library, office, and sunroom attached by several breezeways adorned with plenty of windows, balconies and terraces. The master bedroom has two full baths and private balcony. The 2.17 acre property has a gunite swimming pool, Har-tru tennis court, and lush gardens.